Another woman and her 2 kids were busted in Houston, TX on July 19th for operating an illegal Botox clinic without a license, according to Houston cops. According to the affidavit, Maria Teran has now been busted 3 times for practicing medicine without a license. I don’t know why this is happening, and why people are getting away with this for so long. You don’t see people prescribing normal drugs in clinics without a license, do you? No, it simply doesn’t happen. People must think that it is not that bad, or they are above the law to be attempting this. This family of fake Botox physicians finally got caught after people began reporting that they were getting sick. 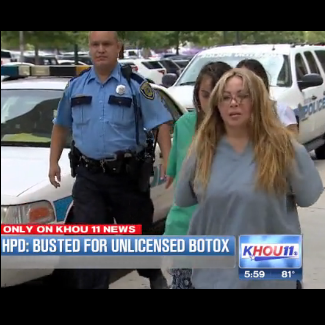 The illegal Botox clinic named “LaFemme” was located in Houston off of Hwy. 6 according to Houston authorities. The family is actually already out on bond on another case. A few weeks ago police initiated an undercover sting and were sent into the clinic for injections. “You know, as physicians, we have decades of training on human anatomy and where to inject and where not to inject,” said Dr. Kim Vo, a local Houston physician. “You can form a granuloma, just a firmness around that area. You can get infections, it is done in a non-sterile environment or it can travel to the bloodstream,” the Houston physician reported. Investigators are looking for people who have received Botox from this unlicensed clinic and asking you to call 713-308-3138 if you have any information.